Every customer has his own specific needs. The van illustrated on this page, a Fiat Ducato, is used by a railway maintenance company to provide technical and logistic support for its daily operations. The company’s services include the maintenance and repair of railway infrastructure, the replacement and modification of railway systems, and fault-finding and troubleshooting in general. The efficiency of the company’s operatives has a direct impact on the safety of rail travel so it is extremely important for the team using this van to have with them all the equipment they need for their job. Let’s have a closer look at this customer’s requirements and the solutions provided by Syncro System. accessories to maximise the efficiency of the van and to convey a more professional image. Autonomy. 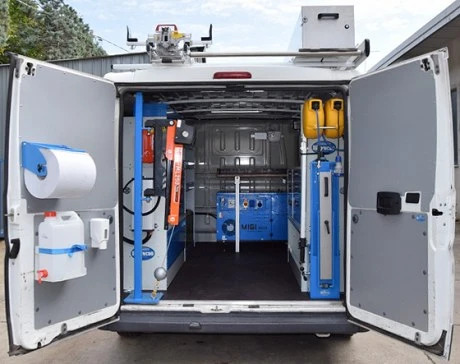 For the operators of this van, autonomy means an independent source of power for the various electrically operated devices they often need to use at great distances from a mains supply. The Ducato shown here is equipped with a compressor-generator combo for this very reason. Electrical energy and compressed are always available. Orderly storage space. 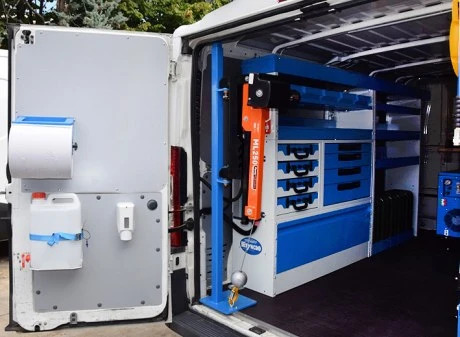 The racking system in this van provides plenty of storage space along both side walls, with a wide range of drawers, shelves and containers for carrying hand and power tools of all sizes, hardware, spare parts and assorted materials. The storage includes metal drawers with non-slip rubber mats and metal dividers, removable plastic containers, tilting containers in transparent plastic and various open shelves. There are also dedicated storage accessories like a rack for metal canisters. The vice with fold-away support occupies a minimum of space when closed. To carry long tools and materials, the Ducato’s roof is fitted with a square section transport tube with an easy extraction system. The roof also boasts a damped action ladder rack. Safety and security. These requirements are satisfied in various ways. To ensure maximum safety for the operators, the resonated plywood panel covering the floor has a non-slip surface for safe access and movement around the van’s load compartment. In the unlikely event of an accident, the safety of the racking itself is guaranteed by the GS safety mark. On the subject of security, the rear doors are fitted with a special semi-spherical lock that prevents unauthorised access to the van’s interior. Accessories. 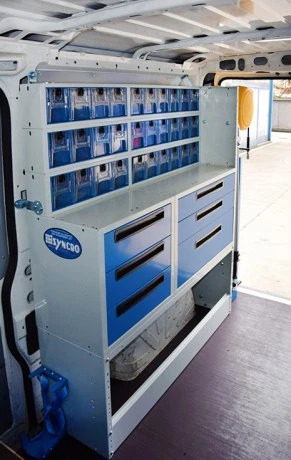 Syncro racking does more than just keep everything tidy inside the load compartment, saving operators valuable time and money. Dedicated accessories also make the van more efficient. 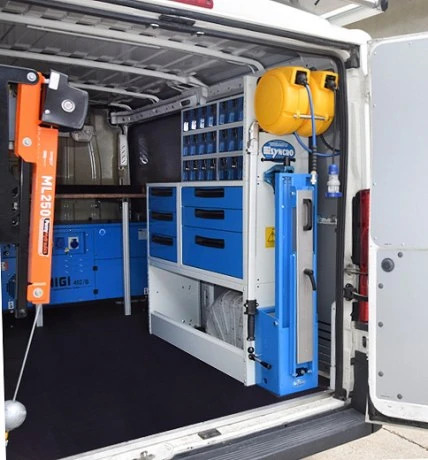 This particular Ducato is equipped with a number of different accessories, including a paper roll holder, a handwash kit with soap dispenser for cleanliness and hygiene, and LED ceiling lights to illuminate the work space.